In his warm, anecdotal style, John Maxwell describes how his prayer-partner method has changed his church and many others - and empowered his ministry. PARTNERS IN PRAYER will give you a complete strategy for revolutionising your church with a prayer-partner ministry. 180 pages, from Nelson. "John, I believe God has called me--a layrnan--to disciple, encourage, and pray for pastors. And the reason I came here today is so that I could pray for you." With those words, respected leader, speaker, and author John Maxwell saw his agenda replaced by God's agenda. The stranger who felt God's calling to pray for this pastor fulfilled a need in Maxwell that he didn't even know he had--and fourteen years later, the results are evident at the 3,500 member Skyline Wesleyan Church in San Diego, California. 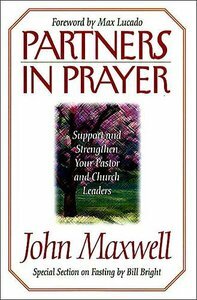 Partners in Prayer, the first book in the John Maxwell Church Resources series, shows church leaders and lay people how to unleash the potential of prayer on behalf of themselves, one another, and the church. If your church--or private devotional life--is starving in the area of prayer and you want to tap into the power and protection prayer provides, Maxwell gives practical insight into --the fundamentals of prayer --improving personal prayer life --praying for others, including church leaders --building a prayer partners ministry in the local church --encouraging prayer revival nationwide * * * Are you missing out on God's gift and blessing of prayer? Is there someone you know who would benefit from your committed prayers on their behalf. Despite God's promise of the power of prayer to change our world, many of us never experience it. John Maxwell shows you how to strengthen your prayer life and reap the benefits awaiting those who become Partners in Prayer.